My first rFactor track: the Cabañas Raras kart track. Located at Cabañas Raras, close to Ponferrada (Spain), it has two layouts: the short one (the one you race in amateur races, with rented karts) and the long one, used in professional races. You can get more information of this track in its official site. Since it's my first circuit, please don't be too harsh. Btw, some things are different from the real track (for example, the pit lane). Actually, lots of things can (and hopefully will) be improved. It is still fun, however, so try it! Any (constructive) criticism is welcome! - Bob's track builder: the whole track was built with this excellent tool (thanks too to the Great Britain Xpack, which contains objects used in this track). - The guys at www.rFactorNews.com for testing it. - Of course, the guys from ISI! There are currently no setups for Cabanas Raras. Add a Setup. Yo vivo en Cabañas Raras. Gracias por hacer este circuito!!! for a first track this is amazing! im waiting on the new BTB to finish before i can make my first track. 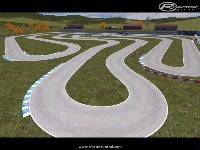 I think this track will be my favorite kart track IF it just had a tiny bit more detail like grandstands etc etc. But the track its self is 100% spot on! GRANDEEEE, lo acabo de ver y lo estoy descargando!!! Muy bueno el circuito, pero se encuentra localizado en Cabañas Raras, no en Ponferrada, apenas los separan 8 km., pero es así.